Greyhound Lines, Inc., usually shortened to Greyhound, is an intercity bus common carrier serving over 3,800 destinations across North America. The company's first route began in Hibbing, Minnesota, in 1914, and the company adopted the name The Greyhound Corporation in 1929. Since October 2007, Greyhound has been a subsidiary of Scottish transportation company FirstGroup, but continues to be based in Dallas, Texas, where it has been headquartered since 1987. 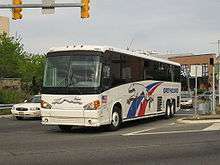 Greyhound and sister companies in FirstGroup America are the largest motorcoach operators in the United States and Canada. In 1915 Wickman joined forces with Ralph Bogan, who was running a similar service from Hibbing to Duluth, Minnesota. The name of the new organization was the Mesaba Transportation Company, and it made $8,000 in profit in its first year. 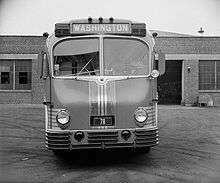 In 1955, the Interstate Commerce Commission ruled in the case of Keys v. Carolina Coach Co. that U.S. interstate bus operations, such as Greyhound's, could not be segregated by race. In 1960, in the case of Boynton v. Virginia, the U.S. Supreme Court found that an African American had been wrongly convicted of trespassing in a "whites only" terminal area. In May 1961, civil rights activists organized interracial Freedom Rides as proof of the desegregation rulings. On May 14, a mob attacked pair of buses (a Greyhound and a Trailways) traveling from Washington, D.C., to New Orleans, Louisiana, and slashed the Greyhound bus's tires. 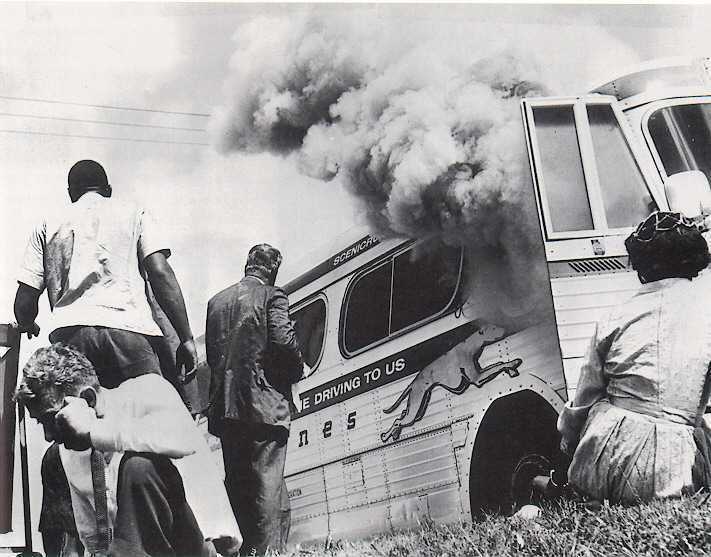 Several miles outside of Anniston, Alabama, the mob forced the Greyhound bus to stop, broke its windows, and firebombed it. The mob held the bus' doors shut, intending to burn the riders to death. Sources disagree, but either an exploding fuel tank or an undercover state investigator brandishing a revolver caused the mob to retreat. When the riders escaped the bus, the mob beat them, while warning shots fired into the air by highway patrolmen prevented them from being lynched. Title II and Title III of the Civil Rights Act of 1964 broadened protections beyond federally regulated carriers such as Greyhound, to include non-discrimination in hotels, restaurants, and other public accommodations, as well as state and local government buildings. In 1972, Greyhound introduced the special unlimited mileage "Ameripass." The pass was initially marketed as offering "99 days for $99" (equal to $561.00 today) or, in other words, transportation to anywhere at any time, for a dollar a day. For decades it was a popular choice for tourists on a budget who wanted to wander across the cities and towns of America. Over time Greyhound raised the price of the pass, shortened its validity period and rebranded it as the Discovery Pass, before finally discontinuing it in 2012. 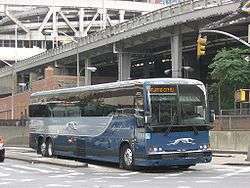 The "New Greyhound" also saw the introduction of a refreshed logo and a new navy blue and dark gray livery for buses, which was rolled out to the nationwide fleet over several years. As the older buses were repainted they were also refurbished, receiving wireless Internet access, power outlets, and new leather seating with increased legroom. Greyhound operates 123 routes serving over 2,700 destinations across the United States. 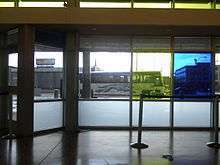 Greyhound's scheduled services compete with the private automobile, low-cost airlines, Amtrak, and other intercity coach companies. Atlantic City: Baltimore, Brooklyn, New York City, Philadelphia and Washington, D.C. In an effort to improve its image, between 2007 and 2014, the company aggressively purchased new coaches and refurbishing existing ones. As of 2016, the majority of Greyhound's fleet has the navy blue and grey "neoclassic" livery on the exterior, wireless internet access, leather seating, and 120-volt power outlets at most seats. 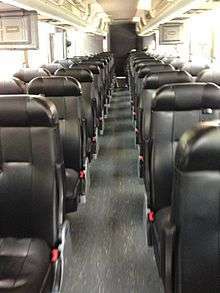 Greyhound's coaches have one fewer row of seats than the industry standard, giving passengers additional legroom. All buses purchased since 2009 have three-point seat belts installed. 1 2 "Greyhound Timetables". Greyhound Lines. Retrieved 12 December 2014. 1 2 3 Sachs, Andrea (3 July 2014). "Greyhound: 100 years old and acting younger than ever". The Washington Post. ↑ Roman, Alex (2015-01-05). "Fleets Growing, Business Strong for Motorcoach Top 50". Metro. Retrieved 2015-05-17. 1 2 3 Lewis, p.92. ↑ "Tracing the Hound: The Minnesota Roots of the Greyhound Bus Corporation" (PDF). Retrieved 2013-09-21. ↑ "Greyhound Bus Museum". 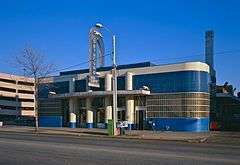 Greyhound Bus Museum. Retrieved 2013-09-21. ↑ Walsh, Margaret (1985). "Tracing the Hound: The Minnesota Roots of The Greyhound Bus Corporation" (PDF). Minnesota Historical Society. pp. 310–320. Retrieved 11 April 2014. ↑ "Greyhound History-The Yelloway Merger". greyhoundhistory.com. Retrieved 5 January 2015. 1 2 Walsh, Margaret. "Tracing the Hound: The Minnesota Roots of The Greyhound Bus Corporation" (PDF). Minnesota History (Winter 1985): 321. Retrieved 11 April 2014. ↑ "Greyhound History-The Name Change". greyhoundhistory.com. Retrieved 5 January 2015. ↑ Hall, Mordaunt. "It Happened One Night (1934): NYT Critics' Pick". The New York Times. Retrieved 11 April 2014. ↑ "Historical Timeline". Greyhound Lines. Retrieved 11 April 2014. ↑ "Transport: Greyhound's Litter". Time. 10 August 1936. Retrieved 11 April 2014. Class I railroads of the U. S. carried 445,995,000 passengers in 1935. Last week, the National Association of Motor Bus Operators announced that non-local bus lines had beaten this mark by carrying 651,999,000 passengers in 1935. An increase of almost 50% over 1934, it was the first time busses had handled more traffic than their biggest rivals. ↑ "Transport: Greyhound's Litter". Time. 10 August 1936. Retrieved 11 April 2014. To keep pace with this new business, the largest U. S. bus line, Greyhound Corp., last week whelped the first 25 of a litter of 305 new busses, completely outmoding present standard equipment. ↑ Luther, Roger. "The Greyhound Runs Again: First Impressions at a Streamline Bus Station". Treasures of the Southern Tier. Binghamton Press & Sun-Bulletin. Retrieved 11 April 2014. ↑ Hampson, Philip (30 October 1954). "The Road to Success". Chicago Tribune. Retrieved 1 July 2015. ↑ "Carl Wickman, Greyhound Bus Founder, Dead". Chicago Tribune. 6 February 1954. Retrieved 1 July 2015. 1 2 3 Belsky, Gary (December 19, 2013). "100 Years on a Dirty Dog: The History of Greyhound". Mental Floss. Retrieved August 30, 2015. ↑ Barnes, Catherine (1983). Journey from Jim Crow: The Desegregation of Southern Transit. New York: Columbia University Press. pp. 86–107. ↑ U.S. Supreme Court. "BOYNTON v. VIRGINIA, 364 U.S. 454 (1960)". FindLaw.com. Retrieved 13 February 2015. ↑ ""Freedom Riders," WGBH American Experience". PBS. Retrieved December 12, 2011. 1 2 3 "Get on the Bus: The Freedom Riders of 1961". NPR. Retrieved July 30, 2008. ↑ Photo of a Greyhound bus firebombed by a mob in Anniston, Alabama Archived June 15, 2007, at the Wayback Machine.. Retrieved February 1, 2010. ↑ Branch, Taylor. "Baptism on Wheels". Parting the Waters: America in the King Years 1954–63. pp. 412–50. ISBN 978-1-4165-5868-2. ↑ Sandoval-Strausz, A.K. (Spring 2005). "Travelers, Strangers, and Jim Crow: Law, Public Accommodations, and Civil Rights in America". Law and History Review. 23 (1): 53–94. doi:10.1017/s0738248000000055. JSTOR 30042844. ↑ Jackson, Carlton. Hounds of the Road: a history of the Greyhound Bus Company. Bowling Green, Ohio: Bowling Green University Popular Press, 1984. 1 2 Smith, Aaron Lake (December 20, 2013). "Riding the Dirty Dog". Vice. Retrieved August 1, 2015. ↑ Lazarus, George (30 May 1989). "Greyhound Cruise Line Making Waves". Chicago Tribune. Retrieved 30 June 2015. ↑ Fritscher, Lisa. "How Disney Cruises Started". USA Today. Retrieved 30 June 2015. he arrangement worked well for eight years, but in 1993 Premier announced that it was trading in on board Disney characters for a new license agreement with Warner Brothers ... Disney entered negotiations with both Carnival and Royal Caribbean in 1993 to replace the exclusive land and sea deal it once had with Premier, but when talks proved unsuccessful, Disney opted to create its own cruise line. ↑ "Strike Over Pay Cuts Halts Intercity Buses of Greyhound Lines". 3 November 1983. Retrieved 11 April 2014. ↑ Townsend, Ed (4 November 1983). "Strike against Greyhound forces customers to leave driving to somebody else". The Christian Science Monitor. Retrieved 9 April 2014. ↑ Townsend, Ed (5 December 1983). "Tentative settlement in Greyhound strike". The Christian Science Monitor. Retrieved 9 April 2014. ↑ Associated Press (6 December 1983). "Greyhound Striker Killed by Training Bus". The New York Times. Retrieved 10 April 2014. ↑ "Ray Phillips and the 1983 Strike Ray Phillips and the 1983 Strike". 31 December 2011. Retrieved 9 April 2014. Tragedy struck about 8:45 am. Lewis Harris reportedly ran a red light and drove through union pickets in a crosswalk at the intersection of U.S. 40 and Ohio 797. Ray Phillips was crushed. ↑ The Associated press (20 December 1983). "Greyhound Strikers Accept Pact; Immediate Return to Work Urged". The New York Times. Archived from the original on 2014-04-17. Retrieved 18 June 2014. ↑ "Historical Timeline". Greyhound Lines. Retrieved 30 June 2015. 1987 The Greyhound Corporation divests its U.S. bus operations. The new company, Greyhound Lines, Inc., establishes its headquarters in Dallas. Fred Currey is the company's new chief executive. Greyhound Lines purchases Trailways, Inc., establishing Greyhound as the largest nationwide intercity bus transportation company. ↑ Associated Press (4 February 1987). "Union, Buyers of Greyhound Settle Contract". Los Angeles Times. Retrieved 9 April 2014. ↑ Thomas C. Hayes (June 20, 1987). "Greyhound in Deal for Trailways". The New York Times. Retrieved January 6, 2012. 1 2 "The Dial Corp. History". Funding Universe. Retrieved 30 June 2015. To minimize confusion for its investors and consumers by distinguishing the company from the Greyhound bus line it had sold off three years before, the company changed its name to Greyhound Dial in March 1990. At the time Teets decided to retain "Greyhound" as part of the company's new name in order to reflect the ten subsidiaries the company still owned that carried the Greyhound name, such as Greyhound Exhibit group. Within the year, however, when Greyhound Dial switchboard operators were still receiving numerous calls regarding bus routes and fares, management decided to make the message clearer still by renaming the company The Dial Corp.
↑ "Viad Corp Sells Greyhound Leisure Services, Inc. to Cruise Line". Business Wire. 17 September 1998. Retrieved 30 June 2015. ↑ Associated Press (6 March 1991). "COMPANY NEWS; Greyhound Dial Is Now Dial Corp.". The New York Times. Retrieved 30 June 2015. The Greyhound Dial Corporation has changed its name to the Dial Corporation to eliminate any association with bus travel. 1 2 "THE GREAT GREYHOUND STRIKES". Angelfire.com. Retrieved January 21, 2015. ↑ Times Wire Services (21 March 1990). "P.M. Briefing: Greyhound Bus Fired on in Va.". Los Angeles Times. Retrieved 10 April 2014. ↑ LaMendola, Bob (3 March 1990). "Greyhound Bust Strike at Nation's Biggest Bus Line Causes Delays, Drives Off Customers.". Sun-Sentinel (South Florida, USA). Retrieved 11 April 2014. ↑ Baker, Bob (5 June 1990). "Strikebound Greyhound Lines Files for Chapter 11". Los Angeles Times. Retrieved 18 June 2014. The 13-week-old Greyhound bus strike, already mired in litigation and anger, grew even more complex Monday when financially ailing Greyhound Lines Inc. filed for protection from its creditors under Chapter 11 of the U.S. Bankruptcy Code. ↑ "Greyhound Bus Drivers End 3-Year Strike With New Pact". The New York Times. May 9, 1993. Retrieved January 21, 2015. 1 2 3 Inquirer Wire Services (31 August 1991). "Judge Approves Greyhound Plan To Reorganize". Philadelphia Inquirer. Retrieved 18 April 2014. 1 2 3 "Complaint: USA v Greyhound Lines, Inc.". Antitrust Division website. U.S. Department of Justice. Retrieved 18 April 2014. ↑ "Final Judgment: USA vs Greyhound Lines, Inc.". Antitrust Division website. U.S. Department of Justice. Retrieved 18 April 2014. ↑ "Greyhound To Buy Carolina Trailways". Google News. 1997-03-10. Retrieved 2013-09-21. 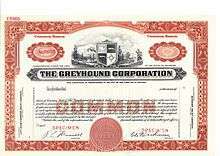 ↑ "Greyhound Acquires Southeastern Trailways Business". Thefreelibrary.com. 1998-07-06. Retrieved 2013-09-21. ↑ "Laidlaw Plans to Buy Greyhound Canada for $72 million". The New York Times. 3 September 1997. Retrieved 10 April 2014. ↑ Times Wire Services (20 October 1998). "Laidlaw to Acquire Greyhound Lines". Los Angeles Times. Retrieved 10 April 2014. ↑ "Greyhound Stockholders Approve Merger With Laidlaw, Inc." (Press release). Greyhound Lines, Inc. 16 March 1999. Retrieved 10 April 2014. At a special meeting of the stockholders of Greyhound Lines, Inc., held this morning, Greyhound's merger with Laidlaw Inc. was approved. The transaction is effective today and as a result, Greyhound has become a wholly owned subsidiary of Laidlaw Inc.
↑ Reuters (29 June 2001). "Laidlaw Units File for Bankruptcy Protection". Los Angeles Times. Retrieved 10 April 2014. ↑ "Greyhound: 100 years old and acting younger than ever". The Washington Post. Retrieved January 21, 2015. 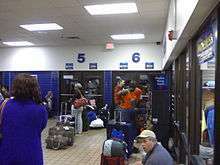 ↑ "USATODAY.com - Some left in lurch as Greyhound cuts stops". USA Today. Retrieved January 21, 2015. ↑ "As Greyhound Cuts Back, The Middle of Nowhere Means Going Nowhere". The New York Times. September 6, 2004. Retrieved January 21, 2015. ↑ "The Greyhound doesn't stop here anymore". Post-gazette.com. 2005-11-13. Retrieved 2015-03-15. 1 2 3 O'Shaughnessy, Patrice (16 June 2003). "Chinatown Bus War Fuels Probe: Slain businessman tied to mob, cops say". Daily News. New York. Retrieved 17 April 2014. ↑ Schliefer, Theodore (2013-08-08). "Bus travel is picking up, aided by discount operators". Philadelphia Inquirer. Retrieved 25 August 2013. ↑ "exv99w1". Sec.gov. Retrieved January 21, 2015. ↑ "FIRSTGROUP COMPLETES ACQUISITION OF LAIDLAW" (Press release). 1 October 2007. Retrieved 17 January 2015. ↑ "Greyhound Gets A Makeover". CBS News. 2007-11-12. Retrieved 2007-11-12. 1 2 "Greyhound New Buses". Greyhound. Retrieved 18 October 2013. ↑ "Even with a ticket, relying on Greyhound bus can be a gamble". Springfield News-Leader. Retrieved January 21, 2015. ↑ "Greyhound Introduces Reserved Seating Program" (Press release). 12 November 2007. Retrieved 15 June 2015. ↑ "Greyhound Modernizes IT Infrastructure to Provide More Pricing Options for Consumers and Optimize Operations" (Press release). 9 December 2014. Retrieved 5 January 2015. ↑ Austen, Ben (7 April 2011). "The Megabus Effect". Bloomberg Business. Bloomberg LLC. Retrieved 4 October 2015. ↑ "Greyhound Introduces New Express Service" (Press release). 12 November 2010. Retrieved 11 April 2014. ↑ McManis, Sam (10 November 2013). "Long-distance buses are cheap and surprisingly attractive options for travel". The Sacramento Bee. Retrieved 5 October 2015. ... there now is heated competition in the long-distance bus industry. The recent rise of Megabus.com, a British company featuring bright blue and orange two-decker coaches that began service in Sacramento in 2012, has prompted Greyhound to expand and upgrade its service. The result is a boon to travelers. ↑ Automotive Writer (7 June 2014). "Greyhound starting to get its stride back". The Dallas Morning News. The Dallas Morning News Inc. Retrieved 5 October 2015. But Leach said the competition should benefit all the carriers because it calls attention to buses. "We're the ones with the iconic brand and the established network," he said. "But the fact that Megabus is coming in just gets buses in general out front and at a time when you've got all these great changes going on." ↑ Forgione, Mary (16 July 2015). "Greyhound starts bus service in Mexico, with connecting routes to Texas". Los Angeles Times. Retrieved 10 September 2015. ↑ Hudnall, David (24 September 2015). "Greyhound to expand Kansas City and Columbia services in light of Megabus' departure". The Ptich. Retrieved 5 October 2015. ↑ "Greyhound Express Perks and Benefits". Retrieved 31 December 2014. ↑ Brock, Katherine Cromer (Oct 18, 2012). "Greyhound Express adds cities to Houston route". Dallas Business Journal. Retrieved 2 April 2013. ↑ "Greyhound and Peter Pan Bus Lines Launch Express Service in the Northeast ; New Service Offers More Schedules, Faster Trips, Lower Fares and Easy-to-Use Regional Website" (Press release). Greyhound. 21 September 2010. Retrieved 22 April 2015. ↑ FirstGroup (Summer 2014). "Greyhound factsheet" (PDF). Retrieved 22 April 2015. ↑ "Grreyhound Express FAQ". Retrieved 31 December 2014. ↑ "Greyhound Connect". Greyhound.com. Retrieved 21 January 2015. ↑ "Greyhound to add Mo. to Iowa round trip service". METRO Magazine. ↑ "Greyhound Charter Services". Greyhound.com. Retrieved 2 January 2015. ↑ "Greyhound Charter Services - Military and Government". Greyhound.com. Retrieved 2 January 2015. ↑ "About Package Express". Shipgreyhound.com. Retrieved 21 January 2015. 1 2 "Greyhound Lucky Streak". Retrieved 2 January 2015. ↑ "Greyhound Services & Routes". Greyhound.com. Retrieved 2 January 2015. 1 2 "QuickLink". Greyhound.com. Retrieved 2 January 2015. ↑ Lentzsch, Craig (March–April 2003). "Making the Connections" (PDF). TR News (225). Transportation Research Board of the National Research Council. p. 32. Retrieved 2 January 2015. Greyhound's Quicklink brand of commuter service operates from Mt. Laurel, New Jersey, to New York City, and from Northeast Sacramento, California, to the Bay Area. Most recently, Quicklink began serving Macon, Georgia, to Atlanta. ↑ Anita Hamilton (2008-06-06). "Beating $4 Gas with a $1 Bus". Retrieved 2008-06-08. ↑ "BoltBus - FAQ". Retrieved 10 April 2014. Every schedule will have at least one $1.00 ticket. The $1.00 ticket will be sold at random and generally within the first handful of seats sold. The earlier you book your ticket, the greater your odds are of grabbing a seat for a buck. ↑ "BoltBus - FAQ". Retrieved 10 April 2014. ↑ "BoltBus - FAQ". Retrieved 10 April 2014. 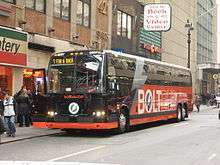 BoltBus is owned by Greyhound Lines, Inc. and is operated in the Northeast region in partnership with Peter Pan Bus Lines, Inc. of Springfield, MA. ↑ Sokolowsky, Jennifer (30 April 2012). "BoltBus to offer $1 fares between Seattle, Portland". Puget Sound Business Journal. Retrieved 11 April 2014. ↑ Nolasco, Joanna (15 May 2012). "BoltBus to launch new Seattle-Vancouver, B.C., service". Puget Sound Business Journal. Retrieved 11 April 2014. ↑ "BoltBus To Launch Service in California on Oct. 31". PR Newswire. 15 October 2013. Retrieved 10 April 2014. ↑ "BoltBus Expands From Los Angeles; Adds Las Vegas, San Francisco Service". PR Newswire. 10 December 2013. Retrieved 10 April 2014. ↑ "BoltBus - FAQ". Retrieved 10 April 2014. The service on the West Coast of the United States and Canada is exclusively owned and operated by Greyhound Lines, Inc.
1 2 "About Greyhound". Archived from the original on February 14, 2014. Retrieved 11 April 2014. Amtrak passengers use Greyhound to make connections to cities not served by rail on Amtrak Thruway service by purchasing a ticket for the bus connection from Amtrak in conjunction with the purchase of their rail ticket. ↑ "Amtrak Thruway Connecting Services Multiply Your Travel Destinations". Retrieved 11 April 2014. ↑ Prabu, Karthick (2013-02-22). "New TSA Pre-check airports, Greyhound goes Big Brother and more travel tech news". Tnooz. Retrieved 2013-03-19. ↑ "Greyhound Applauds National Highway Traffic Safety Administration for Requiring Seat Belts on all New Motorcoaches Starting in 2016" (Press release). Greyhound Lines. 20 November 2013. Retrieved 17 June 2014. 1 2 3 4 "Texas DMV Truck Stop". Texas DMV. Retrieved 24 October 2015. ↑ "Greyhound Facts And Figures > Fleet". Greyhound. Retrieved 22 February 2014. There are 769 102DL3s in the Greyhound fleet, with nearly 75% equipped with wheel-chair lifts. ↑ Hounds of the Road. Books.ggogle.com. Retrieved January 21, 2015. ↑ "My Turn: He's still walking tall, and grateful to be alive". Dailybreeze.com. Retrieved January 21, 2015. ↑ "GREYHOUND BUS/MALONE FREIGHT LINE, INC. TRUCK COLLISION". National Transportation Safety Board. 25 October 1973. Retrieved 15 June 2015. ↑ Jean Heller (May 7, 2000). "The Day Skyway Fell: May 9, 1980". St. Petersburg Times. Retrieved August 30, 2015. ↑ "7 Killed in Collision Of a Greyhound Bus And Trucks in Utah". New York Times. Associated Press. December 19, 1990. Retrieved August 31, 2015. ↑ "National Transportation Safety Board. 2000. Greyhound Motorcoach Run-off-the-Road Accident, Burnt Cabins, Pennsylvania, June 20, 1998." (PDF). National Transportation Safety Board. 5 January 2000. Retrieved 15 June 2015. ↑ "Breaking News, U.S., World, Weather, Entertainment & Video News - CNN". CNN. February 19, 2014. Archived from the original on May 30, 2010. Retrieved January 21, 2015. ↑ "Americas - Knife attack on California bus". BBC. Retrieved January 21, 2015. ↑ TANG, TERRY; DAVENPORT, PAUL (January 23, 2014). "Police: 24 hurt after passenger attacks bus driver". Associated Press. Retrieved January 31, 2014. ↑ "GREYHOUND BUS DEPARTS FROM LA, CRASHES IN SAN JOSE; 2 DEAD, 8 HOSPITALIZED". abc7.com. ABC News. 19 January 2016. Retrieved 29 February 2016. ↑ Early, David (21 January 2016). "Mechanical failure ruled out in Greyhound bus crash in San Jose". San Jose Mercury News. Retrieved 29 February 2016. 1 2 3 4 5 6 "Greyhound buses: in song and on screen". The Guardian. Retrieved January 21, 2015. ↑ Hollmann, Walter L. (May 2, 2011). "The Men In Charge: Best Actor, 1974". Retrieved October 5, 2015. When I think about what I like about Harry and Tonto, I think about his forcing a Greyhound bus to stop because his cat needs to pee. ↑ Hicks, Chris (Feb 8, 1991). "Film review: Sleeping With the Enemy". Deseret News. Retrieved October 5, 2015. ↑ "On Broadway Lyrics". MetroLyrics. Retrieved October 5, 2015. ↑ "Ramblin' Man Lyrics by The Allman Brothers". stlyrics.com. Retrieved 10 November 2012. ↑ "Me And The Devil Blues (take 1) Lyrics". MetroLyrics. Retrieved October 5, 2015. ↑ "Lodi Lyrics". MetroLyrics. Retrieved October 5, 2015. ↑ "See America Right Lyrics". MetroLyrics. Retrieved October 5, 2015. ↑ "Pirate Flag". MetroLyrics. Retrieved October 5, 2015. ↑ "Leaving Town Lyrics". MetroLyrics. Retrieved October 5, 2015. ↑ "I Wish Lyrics". MetroLyrics. Retrieved October 5, 2015. ↑ "DEATH CAB FOR CUTIE LYRICS - Soul Meets Body". www.metrolyrics.com. Retrieved 2016-04-20.